A good boxer uses combinations of punches to beat his opponent. 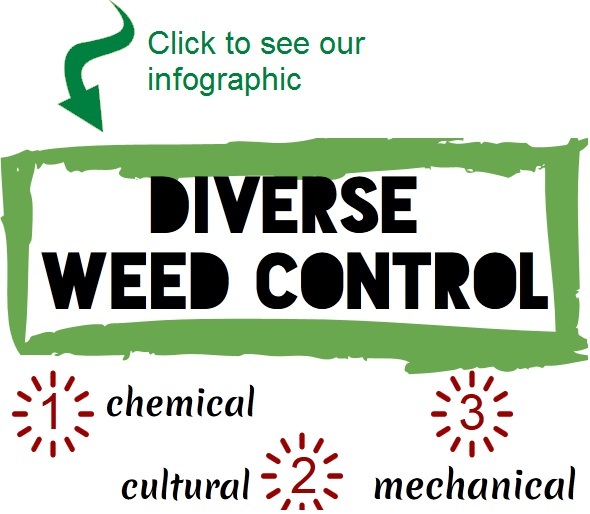 A good farmer uses diverse combinations to beat weeds. Herbicides and crop competition are the left jabs, harvest weed seed control is the right hook that delivers the knock-out blow. 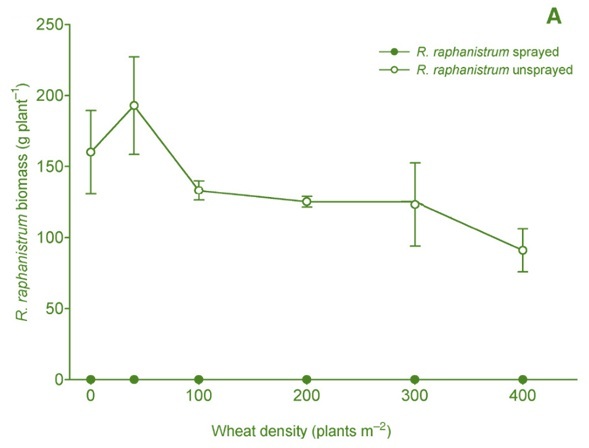 In 2008, AHRI researcher Dr Michael Walsh and colleagues published a paper showing that 2,4-D resistant wild radish could be controlled by 2,4-D if there was elevated wheat crop competition. This demonstrates that if weeds are noticeably affected but not controlled by a herbicide then the additional impact of crop competition can deliver weed control. Despite the widespread occurrence of resistance to 2,4-D, this herbicide continues to be an integral component of wild radish control programs. The combined effects of crop competition plus 2,4-D may explain this. 2,4-D plus competition WILL eventually fail as resistance is enriched over many years of selection. Adding harvest weed seed control (remember the knock-out right hook) will extend the life of herbicides and increase the effects of crop competition by reducing the seed bank. The summary of AHRI’s research from 2008 was that herbicide plus crop competition is better than herbicide alone (although it does have its limits). Michael compared three wild radish populations (susceptible, moderately resistant and highly resistant). Wild radish were sprayed at the two leaf stage with 500 gai/ha 2,4-D Amine (see picture above). Table 1. 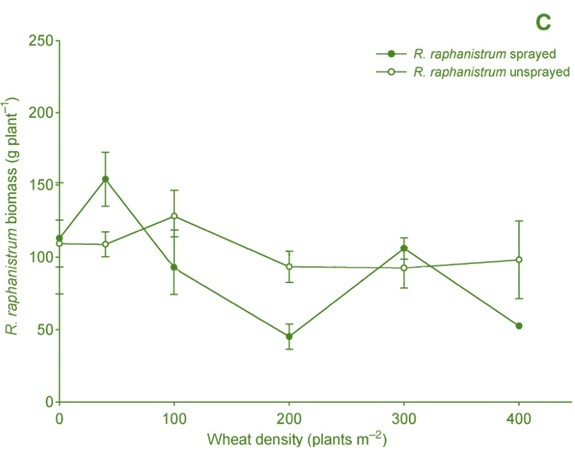 Wild radish biomass reduction at flowering of wheat and wheat maturity after spraying with 500 gai/ha 2,4-D amine for three wild radish populations in the absence of crop competition. The resistant wild radish plants were damaged by the herbicide but went on to survive and set seed. 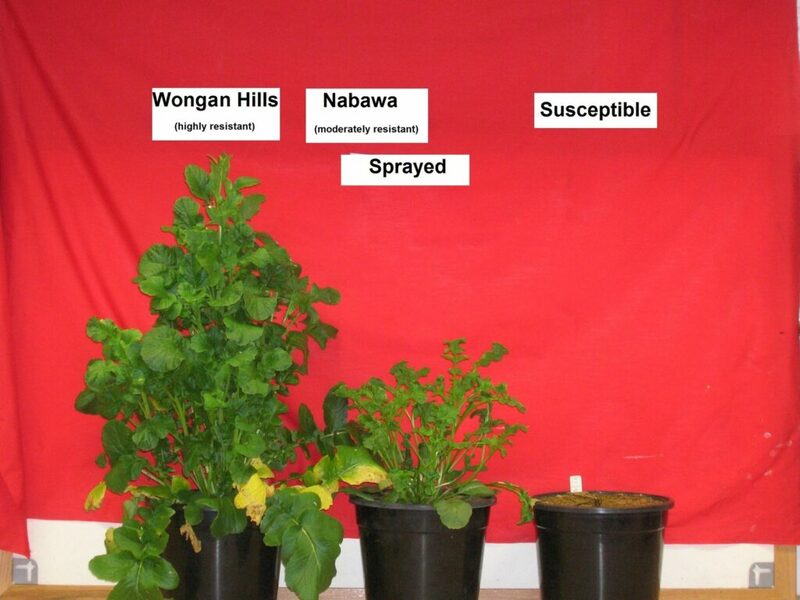 The Wongan Hills population was less affected by 2,4-D that the Nabawa population and by maturity had completely recovered and had the same biomass as the un-sprayed wild radish. When crop competition was added to the scene, things got interesting. 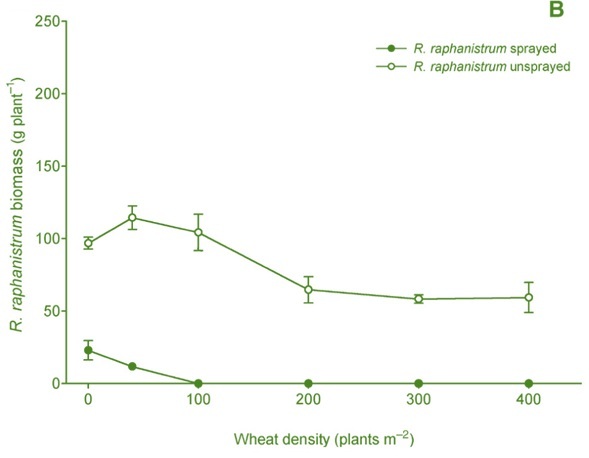 The susceptible population (graph below) was completely controlled by 500 gai/ha 2,4-D regardless of the level of crop competition. Adding competition to the un-sprayed wild radish reduced the biomass of the wild radish. The population from Nabawa (see graph below) had survivors in the absence of crop competition, but there were no survivors when there was competition with 100 wheat plants /m2 or more. The biomass of the Wongan Hills population was only slightly affected by increasing crop competition. Figure 1. 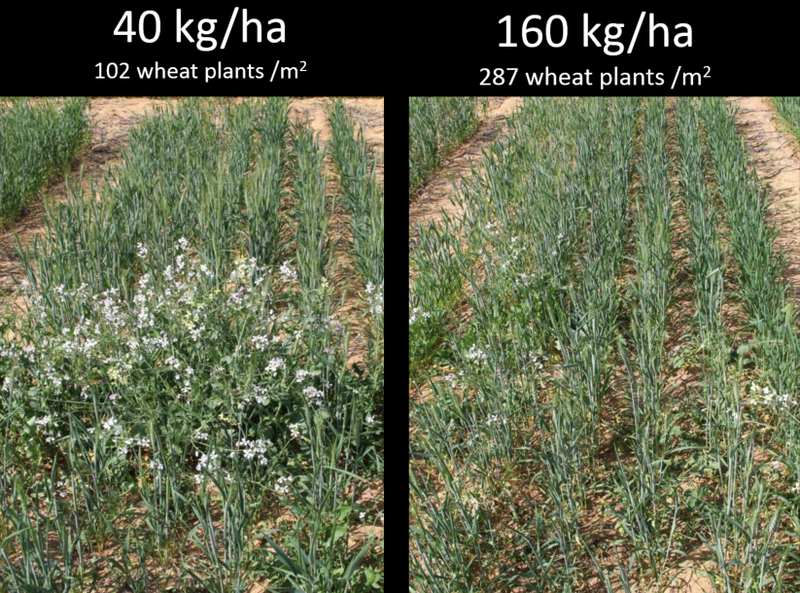 Wild radish plant biomass for three populations (A) susceptible, (B) Nabawa, and (C) Wongan Hills; subjected to increasing wheat competition and sprayed or un-sprayed with 2,4-D Amine 500 gai/ha. This result possibly explains why wild radish at present is being controlled by 2,4-D based herbicide treatments despite the high frequencies of 2,4-D resistance in wild radish populations. The picture below is from a Department of Agriculture and Food trial at Binnu, WA in 2012. This picture shows how well wheat sown at high seeding rates can suppress the growth of un-sprayed wild radish through crop competition. There was a 1m wide un-sprayed strip of wild radish that ran through the middle of the trial pictured below. The biggest funder of agricultural research in Australia, the GRDC has funded some field trials into wild radish in the Geraldton area through the Regional Cropping Solutions Network (RCSN) over the past two years. Grant Thompson from Crop Circle consulting was responsible for these trials in 2013. At one of his four sites, a resistance test confirmed that wild radish had 100% resistance to the Group B herbicide Logran® and 60% resistance to 2,4-D ester. However, in the trial, a mix of Logran plus 2,4-D ester gave 100% control of the wild radish. The radish took a very long time to die but they did eventually die. Grant concluded that the key is to spray small wild radish with excellent application and use a two spray strategy, in the presence of a competitive wheat crop. See link to this work below. In 2012, Peter Newman (then Department of Agriculture and Food) was responsible for the RCSN trials in the Geraldton area. Peter made the same conclusions as Grant Thompson. At one site, the wild radish was highly suspected to be 2,4-D resistant (a later test confirmed this). Once again, small wild radish were sprayed with robust rates of 2,4-D with excellent application, surrounded by a competitive wheat crop. The wild radish took a very long time (8 weeks) to die but they did eventually die. Competition plus herbicide is a great combination but it has its limitations as can be seen by the Wongan Hills population. If we were to rely on herbicides such as 2,4-D only, it is highly likely that we would enrich the level of resistance to 2,4-D and the herbicide plus competition strategy will eventually fail. It is imperative to add harvest weed seed control to the equation. By removing the seeds of the resistant survivors at harvest, the seed bank is minimised and the life of the herbicide is extended. Remember: follow those left jabs with your right hook. It’s the only way to win.